Optimization problems in energy management are concerned with the planning of production and distribution of different energy sources (power, gas), in order to cover a given customer's demand. In this context, the consideration of transportation networks, of uncertainties (demand, price, meteorological parameters) and of market equilibria represent particular mathematical challenges. 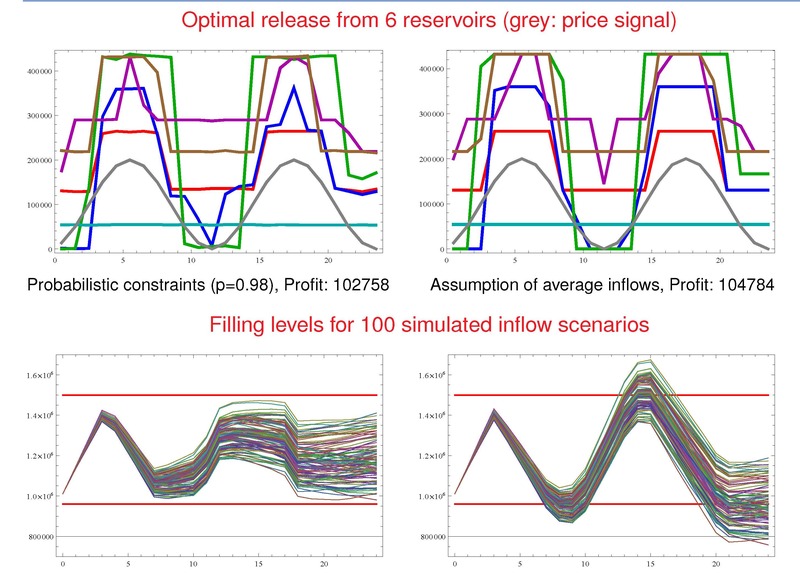 The focus of applications is on the optimal management of water reservoirs under random inflows as well as on optimization problems in gas networks under uncertain loads, such as the maximization of gas network capacities. Mathematical disciplines involved are mainly stochastic and nonsmooth optimization. Modeling uncertain parameters in the feasibility restrictions of such optimization problems leads to so-called probabilistic constraints which guarantee that a computed cost optimal decision is also robust in the sense of probability with respect to later realizations of randomness. The efficient algorithmic solution of probabilistic constraints in the mentioned problems is the main topic within this application theme. The research on optimization problems under probabilistic constraints led to an intensive cooperation with EDF (Electricité de France) and resulted in particular in a reasearch project funded by the Fondation Mathématique Jacques Hadamard. Here, the management of water reservoirs with random filling level and/or demand constraints is in the focus. Furthermore, suitable models of probabilistic constraints are considered within a DFG/Transregio priority programme on optimization problems in gas networks where uncertainty prevails in the loads. In connection with this research, the monograph 'Evaluating Gas Network Capacities' published at SIAM has been co-authored. This monograph has been awarded the 'Euro Excellence in Practice Award 2016'.